the little things: Sally Hansen Nail Polish Strips ... review! 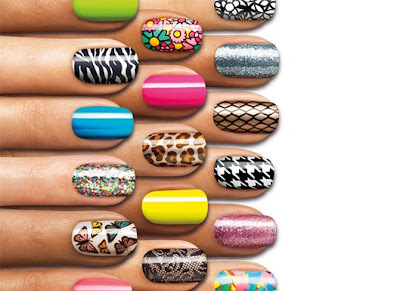 Sally Hansen has come out with something to compete with all of those expensive nail salon trends, such as "Minx" which I'm sure you've seen some celebrities tweeting and raving about. I had a customer come in to my work last week with an adorable floral pattern on her nails, and I had to ask her about it. She told me they were actually from Sally Hansen, and she bought the strips from the CVS store across the way. I was stoked! I've been wanting to try the "Minx" nails for a while, but seriously... it's just too expensive. (I think it ranges from 30-50$ and there really aren't that many salons that do it, unless you want to travel to Beverly Hills or some high end salons). I've also noticed that Sephora has a few of these that they offer ... but I've only noticed 4 different patterns you can choose from. Soo.... after work I hurried over to CVS and found these little lovelies. The above picture shows just a bit of the designs that they offer, but there are a bunch more. And, they come in a little box like the picture below. The kit includes everything that you will need: the color strips, a little nail file/nail buffer and a cuticle stick. They are really easy to put on too! You just peel them off and place them on your finger tips, smooth them down, and use the nail file that is provided to take the extra off the top :) The strips are actually made from real nail polish, so they are smooth when they are on and they can be taking off with nail polish remover too ... super easy! Aren't they fun?! This design wouldn't of been my first choice, but it was either this, gold glitter, or bright yellow. I can't wait to go back to CVS and see all the other patterns once they get them in. So the end result: I love them! They were about $10 which is a tad bit pricey but I think it is worth it every once in a while to do something different than your normal nail polish color. It's supposed to last for about 10 days, so we'll see if they actually hold up with the type of work I do and how much I use my hands. I'll keep you updated!